From the extra generous satchel to the just-so perfect shape of the Doctors Tote, the Pueblo series is an elegant way to cart your knitting around! 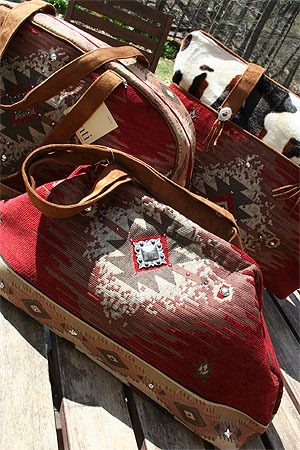 Gorgeous new line of bags with a Sante Fe Feel. Warm red tapestry with silver and garnet accents. From the large overnighter, to the small pouch, these are fabulous accessories designed with the knitter in mind!